Read through the articles in the StogieGuys.com A-Z Guide to Rye and you’ll notice lots of references to Indiana rye (LDI/MPGI/Seagram’s are just a few of the operation’s names). As complete a list as I know of companies that sell their ryes is available here, but some of the best-known include Bulleit, Templeton, George Dickel, Angel’s Envy, Willett, and High West (though the latter two also have other sources for their rye). While some of the companies that sell MPGI products obscure the source, MPG Ingredients, as the former Seagram’s distillery is now known, is very upfront about what it offers. Aside from its 95% rye mashbill, it has recently added two additional rye recipes with lesser rye contents. The biggest reason MPGI’s rye is so ubiquitous is, at a time when rye is hot, MPGI actually has a significant amount of aged stock to sell. In my opinion, a second and nearly as important reason is that the 95% rye is quite drinkable at a relatively young age, with much of it presumably bottled at between two and five years of age. 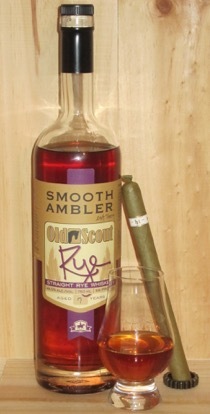 This makes the Smooth Ambler’s Old Scout offering a little different. The 99-proof rye features a 7-year age statement, which sets it apart from other widely available Indiana ryes. The result is a copper-tinted whiskey with citrus, candied fruit, and light oak. The palate has good wood spice, but also deep bourbon-esque sweetness and floral notes. The finish has some pickle brine and orange peel. Pair it with a medium-bodied cigar like an Arturo Fuente King T Rosado Sun Grown, Bolivar Royal Corona (Cuban), Tatuaje Black, or RoMa Craft Intemperance. At $40 a bottle, Old Scout Rye is a nice value with enough complexity to be enjoyed neat, but it also makes a nice Manhattan. It’s not as brash as Bulleit (one of my favorite value ryes) but the age gives it more woodiness and depth of flavor.